This species is accepted, and its native range is Tanzania to N. Botawana. Syntypes: Malawi, Namadzi (Namasi), Cameron 8; without locality, Buchanan 1090 (K, syntypes; B, fragments). Bushy shrub extending to 1.5 m, with relatively short lateral branches, glabrous except very occasionally on the inflorescences and even more rarely on youngest twigs; branchlets compressed at first, pruinose, soon terete, rather stout, brown to grey, with late emergence of lenticels Bushy shrub extending to 1.5 m, with relatively short lateral branches, glabrous except very occasionally on the inflorescences and even more rarely on youngest twigs; branchlets compressed at first, pruinose, soon terete, rather stout, brown to grey, with late emergence of lenticels. Montane forest edges, riverine forest and generally higher rainfall miombo woodland; 600–1800 m; on various hosts, most commonly Ficus, Bridelia and various legumes; flowering October to March. 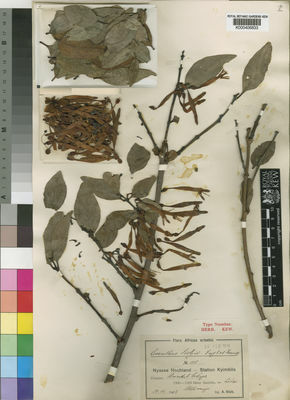 Several specimens from the Tanzania-Zambia border region, including Schmidt, Gereau & Mwangoka 1245 (cited above) and Mbala, R.E. Fries 1270 (B), are exceptional in having puberulous peduncles and pedicels, and a few small hairs scattered on the corolla; the single gathering seen from Tete (cited above) is also hairy. See note under A. flammeus. The forest-edge forms are probably less glaucous and sometimes redder flowered than those from miombo woodland. ZIM W, ZIM E, ZIM C Botswana Zimbabwe. Mozambique Malawi Zambia BOT N, ZAM N, ZAM W, ZAM C, MAL N, MAL C, MOZ N, MOZ T Also in SE Dem. Rep. Congo and Tanzania. Calyx 0.3–0.8 mm long, with broad shallow teeth. Style with a neck 2.5–4 mm long; stigma 0.8–1 mm across, capitate. Bushy shrub to 1.5 m., with relatively short lateral branches, glabrous except very occasionally on the inflorescences and even more rarely on youngest twigs; branchlets compressed at first, pruinose, soon terete, rather stout, brown to grey, with late emergence of lenticels. Leaves mostly subopposite, more alternate on long shoots, with smaller, more rounded, shorter petioled leaves clustered at the base of lateral shoots; petiole 0.5–2(–3) cm. long; lamina glaucous (?always), coriaceous, lanceolate to ovate-elliptic or oblong-elliptic, 3–12 cm. long, 2–6 cm. wide, bluntly pointed at the apex, cuneate or rounded at the base, with 3–6 pairs of lateral nerves, the lower ones more ascending. Umbels or heads (4–)6–16-flowered; peduncle 5–12 mm. long and pedicels 5–8 mm. long, normally glabrous, occasionally puberulous; bract ovate-triangular, pointed to truncate, 1.5–2 mm. long. Calyx 0.3–0.8 mm. long, with broad shallow teeth. Corolla 4–6 cm. long, orange to pale flame-red, with yellow band around vents, bud-tip darker and slightly ribbed, glabrous or very rarely with a few small scattered hairs; basal swelling ovoid-ellipsoid to ovoid-globose, 5–9 mm. long, 4–6 mm. in diameter, with the tube constricted for 2–11 mm. above; lobes erect, 9–11 mm. long; upper expanded part linear-elliptic, 5–7 mm. long, 1–1.5 mm. in diameter, hardened inside, keeled outside. Stamens inflexed; tooth 0.3–0.5 mm. long; anthers 2.5–4 mm. long. Style with a neck 2.5–4 mm. long; stigma capitate, 0.8–1 mm. across. Berry red, obovoid, 10–12 mm. long, 7–8 mm. in diameter. Edges of montane forest, in riverine forest and generally higher rainfall Brachystegia woodland, on various hosts, most commonly Ficus, Bridelia and various legumes; 1000–1900 m.
White, Dowsett-Lemaire & Chapman, Evergr. For. Fl. Malawi: 346, fig. 123A–E (2001). Polh. & Wiens, Mistletoes Afr. : 170 (1998).